Belgium, mostly famous for the world’s most luscious chocolate, chips and locally crafted dark ales, is also home to exquisite medieval towns, Unesco sites, and the Flemish Primitives. The region was a crucible of European Painting when, in the 15th century, Western representational art had been transformed by painters in Bruges, whose mastery of oil paints allowed them to simulate reality and paint faces that expressed real emotional states. There is much more to explore on the art scene of course, from masterpieces of Antwerp’s most famous 17th century resident, Pieter Paul Rubens to art nouveau marvels and the country’s great contemporary scene with state-of -the-art museums. Belgium’s approach to treatment and scientific analysis of easel paintings has been internationally acclaimed and the country houses a number of high-profile museums and private paintings conservation studios. 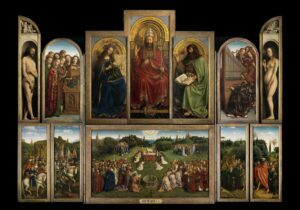 With one of the most significant paintings conservation projects currently undertaken in Europe – the restoration of the Ghent Altarpiece, it could not be a better time to visit a selection of studios in Brussels, Antwerp, Bruges and Ghent. What’s more, the trip will allow the conservators from the UK to exchange ideas and discuss different attitudes to structural treatments, cleaning and varnishing of paintings with their Belgian colleagues. Radek Chocha, a Belgium enthusiast, will be leading the trip and if you have any queries and would like to get in touch with him, please send an email to: radoslaw.chocha@yahoo.co.uk. Cost: Tickets – £100 (BAPCR members). There are 15 places available with 2 tickets offered to student members on full time courses at a reduced fee of £50 (BAPCR student members). Priority will be given to BAPCR members until the 30th May 2019. If there are any places available after this date, non members will be welcome to join the group. The BAPCR takes the safety of its members during visits very seriously and much consideration goes into such planning. Belgium is not considered by the Foreign Office to be a destination of high risk. However, we would like to encourage all members to make an informed decision and to acknowledge any possible risk associated with travelling abroad. Flight/train and accommodation booking would be the responsibility of individuals, although specific flights/train journeys can be recommended for people to travel together. We recommend accommodation based in Brussels for the duration of the trip as train rides from Brussels to Antwerp, Bruges and Ghent take usually just over half an hour. There will also be ample opportunity for sampling the local cuisine, especially in the evenings. Please email BAPCRsecretary@gmail.com to book your place.